There's a dry little twig of mistletoe hanging in the doorway entrance to the living room at the Duck and Cherry. It hangs there all year around. I don't see the need to take it down the other eleven months of the year, although Arnfinn claims that he doesn't need a mistletoe to kiss. Even so, I definitely need to replace the dried out little sprig with a fresher one. When we lived in Austria I saw the farmers selling large balls of mistletoe on the Christmas markets. The Austrian hang mistletoe with red ribbons on their front door for luck during the season. 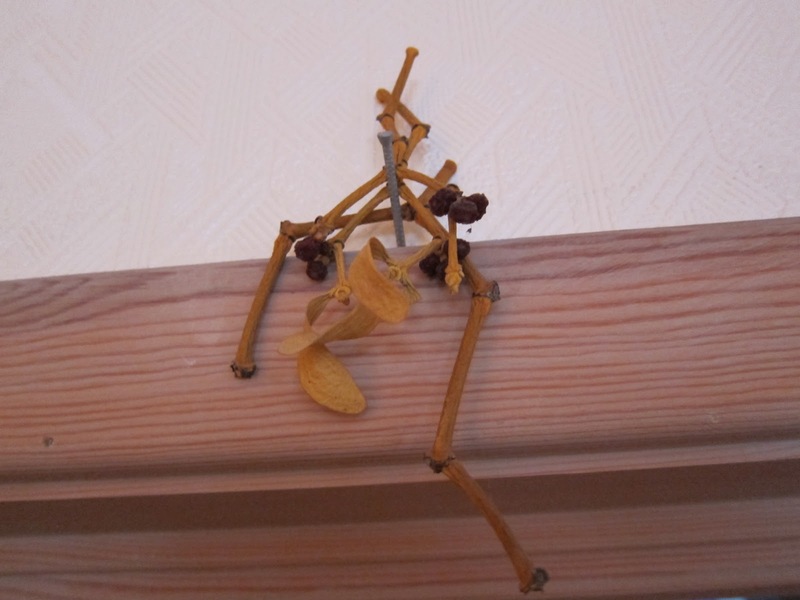 Some put a sprig on the threshold to ward off nightmares. I walked up to an older man selling large branches of mistletoe on a stand at the large Christmas market in Linz one December day. "I would like to buy a small twig of mistletoe," I said. "Can't do that," he answered gruffly. "I only sell whole balls." I looked at the large mistletoe and my imagination started flashing images of romance and kissing in abundance in the doorway. "You can do a lot of kissing under such a large branch of mistletoe," I said and laughed. The man was just as serious and clearly had no idea what I was talking about. He was surely missing out on a lot of fun - and Christmas romance. Tradition says to hang the mistletoe in the ceiling during the Christmas season. If a woman stands under the mistletoe, she has to allow anyone to kiss her - no protest. For every kiss the man would pick a berry and when the berries ran out, so did the kissing. The berries actually hold a very sticky substance used for making glue and in olden days it was used to catch birds. The thing is, the juice from the mistletoe is quite poisonous if it gets into the bloodstream. We like to live dangerously, don't we? Mistletoe or Viscum album is a protected species in Norway, since 1956, actually the first plant to be protected in this country. 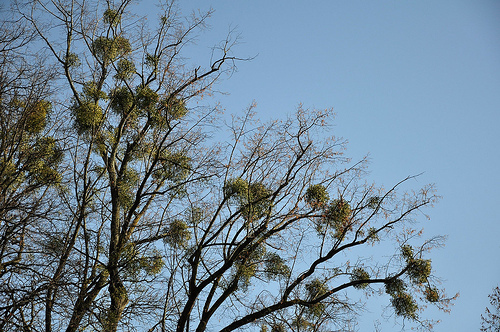 Trees with mistletoe cannot be cut down or hurt in any way. Even though it is a hemi-parasitic shrub that lives on the stems of other trees, it is attractive and rare enough to be allowed privacy. 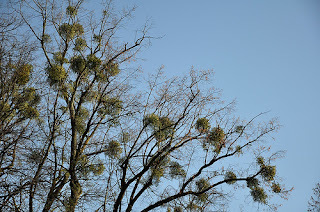 When you look at a tree with a large mistletoe against the blue sky, it's easy to think it's a bird's nest and not a growing plant. Close up the plant is pretty with small rounded leaves and white, shiny berries. 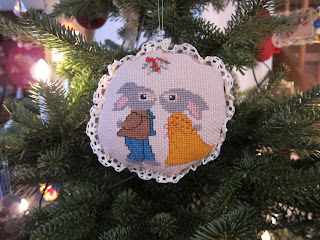 Photos today: one of my beloved cross-stitch Christmas tree decorations, the small dry sprig over our door, and a tree with mistletoe in Salzburg. Utrolig søte de to kaninene på juletrepynten. Jeg har faktisk korsstingsputer på juletreet. Er veldig glad i dem. Lagde dem da barna var veldig små.